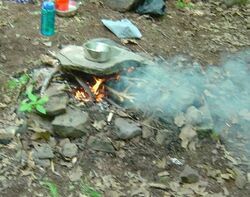 Campfires can be used for cooking food by a number of techniques. Cooking food using a campfire can be tricky for those not accustomed to it and campfires are illegal in many areas so many campers prefer to use a portable stove instead. The techniques for cooking on a campfire are no different from those used for everyday cooking before the invention of stoves or where stoves are still not available. Individuals who are backpacking in an area that allows the gathering of firewood may decide to cook on a campfire to avoid the need to carry extra equipment; however, most campfire cooking is done in front-country campgrounds. Possibly the simplest method of cooking over a campfire and one of the most common is to roast food on long skewers that can be held above the flames. This is a popular technique for cooking hot dogs or toasting marshmallows for making s'mores. Another technique is to use pie irons — small iron molds with long handles, into which can be placed slices of bread with some form of filling — which are placed over hot coals to cook. Grills are also simpler to use and they tend to make the food pick up flavors from the smoke. Grills over a campfire are used in the same way as ordinary charcoal barbecues. If the food is simply placed on the grill, it may catch fire so it requires constant attention. Handleheld grills that clamp over the food may be used for various tasks like warming food, grilling burgers or sausages or making toast. A pot hanging over the fire, although picturesque, may spill, and the rigging may be difficult to construct from found wood. Generally this is done with metal rigging, much of it identical to that historically used in home fireplaces before the invention of stoves. Two vertical iron bars with an iron cross-piece allow pots to be hung at various heights or over different temperatures of fire. Griddles, grills and skewers can also be hung over the fire. When working with wood, one may use two tripods, lashed with tripod lashings, but the rope will be liable to melt or burn. Dovetail joints are more secure, but difficult to carve. A good alternative to cooking with a tripod is to cook directly upon the fire itself. To do this properly the fire needs to have a reasonable bed of coals and to have burned down to the point where it is not a roaring fire. While the pot may be set directly upon the coals, this is not preferable since that will tend to extinguish the coals. To lift the pot up off the fire, often two small logs of similar size may be used on either side of the pot. This allows continued airflow through the fire while providing optimal heat. The one down side to this form of cooking is that the pots will become blackened with soot and ash, which can be difficult to scrub off. The ash and soot build up can be easily avoided by applying a thin layer of dish soap (preferably biodegradable) to the outside of the pot before cooking. The ash and soot will stick to the soap which is then easily rinsed off later. Dutch ovens are specially designed for camping. The oven is placed in a bed of hot coals, often from a keyhole fire with additional coals placed on top of the lid, which usually has a raised rim to keep the coals from falling off. Dutch ovens are made of cast iron or aluminum, and are not suitable for backpacking. Dutch ovens are convenient for cooking dishes that take a long time such as stews, joints of meat and baked goods. They are the not the only option for baking on a campout as devices for baking on portable stoves exist and clay ovens can be constructed at longer encampments. Reflector ovens are placed on the ground next to the fire, and gather thermal radiation from it. Other simple methods include plank grilling, where food is cooked on a wooden plank set vertically next to the fire, and hot-stone cooking, where food is placed on a heated stone next to or even in the fire or where fire-heated stones are dropped into a pot. Another commonly used technique is the baking of food in aluminum foil packets. Food is wrapped inside a durable packet of tin or aluminum foil, crimped to seal, and placed on or under hot coals. Baked potatoes are commonly cooked this way. However, this method of cooking is actually deleterious for your health. Aluminum foil is made from extremely thin aluminium metal which needs to be protected from oxygen in the air or it will oxidize to a white powdery compound (aluminium oxide). This protection is generally afforded by coating both sides of the aluminum with plastic polymers which are kept flexible because of the plasticizers they contain. The problem with cooking food in this material is that the plastic dissolves in the fats and carbohydrates in your food and contributes monomers of plastics to your diet. These have been shown to be carcinogenic and are banned or controlled substances in most foods. Once the plastic layer is gone, the aluminum is free to oxidize and so when a baked potato in unwrapped, the foil is generally a dull grey to powdery white. While some aluminum metal is harmless, high levels may contribute to the development of Alzheimer's disease with prolonged exposure. For this reason, cooking food which makes contact with aluminum foil is not recommended. Only use it as a vapor barrier where it does not come in direct contact with food, particularly fatty or moist items. The way to adapt recipes where food is wrapped in foil is to use a barrier such as baking or silicone paper between the food and the foil. Special precautions are required for camping in bear country because cooking activities and food storage attract these potentially dangerous animals. Food preparation and storage must be located a safe distance from sleeping areas, so a fire near camp cannot be used for cooking. Food needs to be stored in bear cans or bear bags hung from a tree or post. Other animals may be attracted to food too; most notably raccoons, squirrels and mice. Camp Recipes - Camping never tasted so good! This page was last edited on 27 December 2009, at 16:26.